In narrative contexts, inoculation refers to the function that opposing ideas may have in strengthening the ideas they critique. For example, the desensitization of familiarity might complement the cognitive dissonance reduction of a concept too difficult, dissonant, or fear-inducing to fit into everyday governing narratives. ... Commodification ... exemplifies yet other paths by which symbolic mechanisms help to vaccinate us against the viral critiques and crises that might suggest problems with our current practices or explanatory frames. 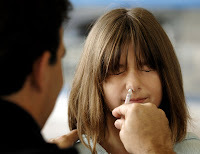 With the circulation of H1N1 and our attempts to inoculate against the rapidly changing virus, the metaphor of inoculation has gained recent resonance. I saw the concept mobilized for the first time during the last month on an agriculture website, not exactly the place I'd expected it: the basic argument (not phrased in the vocabulary of inoculation, but using the concept) was that organizations like the Humane Society have been successful in their campaigns critiquing mainstream meat production practices in part because consumers have become unfamiliar with the stories that describe modern agriculture. In a fascinating rhetorical prescription, the essay author suggested that instead of promoting abstract agricultural products as symbolically desirable ("Beef, it's what's for dinner," Pork, the other white meat," and "Got milk? "), modern farmers needed to grab the narrative bull by the storied horns, and give consumers a taste of the same process-oriented story that has served critics so well. This prescription is striking, and suggests some interesting categories of effect for the implementation of inoculation. At one extreme, inoculating someone with a story line could be likened to desensitization. What starts as exposure therapy, making the ascent of elevators an acceptable trajectory and experience, may end up inuring soldiers, for example, to situations that are understandably emotion-provoking. In the livestock case in question, this line of reasoning might suggest, give people enough of the stories of confined animal raising that form the backbone of the agricultural horror genre, and they will stop having such overblown (it is implied) reactions to cute piggies in concrete stalls. And I suspect that this is, in fact, the goal in mind. For many farmers and those close to them, a clearer sense of the story of the everyday life of farming puts the photogenic plight of livestock in a context where the difficult structural circumstances and human drama make the decisions that lead to particular livestock practices seem inescapable -- and perhaps familiar, inoculated against. However, as much as this may well happen to some degree, looking at what appears to happen to many people as they are exposed to vaccination-level doses of stories coded as upsetting by many mainstream audiences, it appears that any analysis of narrative inoculation also has to consider the narrative structures that make things sayable -- or not. In the same way that "cancer" is said only in a whisper by some, talking about where food comes from -- particularly if its origins might elicit an emotional response -- is taboo for some, or at least not "table talk." This suggests the presence of guiding scripts, such as the film scripts to which I've linked above -- the narratives that make it ok to talk about raw meat and its origins, for example, or that give us exploratory guidelines for heading into such territory. This raises further interesting questions about what happens when someone is exposed to a story fragment such as "confined animals gain weight faster" vs. "confined animals pine for outdoors" -- each three word phrase evokes such vastly additional stories, and yet, would one inoculate against the other? If I had thought, "on the one hand, they do gain weight faster," does that moderate the resonance of the story I envision along with, "pining for outdoors"?